Martin unveils the Viper Profile at Prolight+Sound / Musikmesse 2012. Chauvet will showcase new products ideal for the production, touring and theater markets at LDI 2011, booth 183,including the Legend 412 pixel-mapping moving yoke, Q-Wash 560Z-LED quad-colored moving yoke wash, the COLORado Zoom Tour PAR-style wash, the Amhaze professional hazer and the MVP Series of modular video panels. The Martin Professional MAC Aura is an LED moving head wash light with zoom that offers aura effects plus functions as a single-lens wash with pre-mixed color. The Intimidator Spot LED 150 and Intimidator Wash LED 150 have a number of features for such lightweight, compact fixtures. 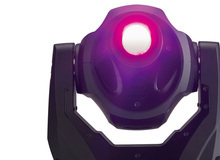 The Q-Wash 260-LED is a LED moving head with 37 RGB LEDs and a 6-degree beam angle, which can serve as a wash light and mid-air effect fixture. Eurolite enlarges its series of LED moving lights, starting with the Eurolite LED TMH-10, available from now on. The new American DJ DMX club effects - the VioMOON LED, VioSCAN LED and VioROLL LED are powered by a 10-watt homogenized LED source that’s comprised of 4 different color LEDs (red, green, blue and white) in one lamp. Chauvet announced the launch of over a dozen new wash lights, moving yokes and event lighting fixtures at LDI 2010, including two new members of the Q Series family. StudioPix is a hybrid wide-angle moving yoke LED wash light with programmable graphic imaging, and the second product in High End Systems’ new line of Pixelation Luminaires.